A weed-free lawn is the ultimate wish of every homeowner. There are things you need to know in choosing the best weed killer to kill those unwanted plants. Identify the type of weeds in your lawn. Assess the extent of the weed problem. You’ve spent days, weeks and even months nurturing your lawn then out of nowhere lawn weeds start sprouting out. What a disappointment! Any plant that is an unwanted growth in your lawn is a weed which is rooted in the soil. Weeds can also get planted in your lawn by the birds, the wind and even from your feet! When you are tending a lawn, you will definitely have to deal with weeds and the only question left unanswered is when these weeds will start to appear. There are a lot of products available you can use to kill all those weeds in your lawn. Before choosing any product, read on and learn everything you need about lawn weeds and how to effectively deal with them. As with anything that you buy, nothing beats an intelligent choice. A well-manicured and weed-free lawn is always a sight to behold. Compacted soil due to over-tilling. Hard soil such as clay. Thinning grass due to disease or insect infection. Wrong mowing, irrigation and fertilization methods. Different types of weeds grow in a different environment. You can try to pull weeds out, but they will keep on coming back. You can lessen the growth of weeds though. You can even get rid of them for good. Well at least for the meantime. A thorough understanding of weeds will help you in choosing the best ways to attack them. The thing with lawn weeds is they are at first invisible. By the time you notice their appearance they have already matured and are ready to reproduce! Most lawn weeds grow from their seeds, stems or underground tubers. To effectively combat lawn weeds, you need to know the types of weeds you are dealing with. Correctly identifying the type of weeds in your garden will be a big help in choosing the right weed killer product to use. Broadleaf Weeds: They are easy to identify because they do not look like grass. They stick out in your lawn like a sore thumb. They are feisty and strong. They thrive on lawns that have compacted soil and lack nitrogen fertility. (e.g. Dandelions,White Clover, Ground Ivy, Yellow woodsorrel, Spotted Spurge). There are weed killers that can eliminate each of these types of weeds. Some weed killers attack a variety of weeds while some are specific to a particular weed type. Weeds make lawns unattractive. However, there is more to weeds than just being unsightly. Weeds absorb water, nutrients, and sunlight that are intended for grass. Since they grow in astounding proportions, they often take in more potassium, nitrogen and phosphorous. Lack of these nutrients will make grass susceptible to insect infiltration and diseases. Weeds steal space otherwise intended for grass to grow. They are deadlier than insects and diseases. You need to control the growth of weeds before they can create havoc in your lawn. Winning over lawn weeds can be a daunting task. It is, you may think, impossible to stop a Dandelion from infiltrating your lawn when one of them can produce about 15,000 seeds which can survive for at least six years. To add to that, every Dandelion that matures can again produce 15,000 more seeds each! When you decide to have a lawn, you must know that you have to deal with weeds. While weeds can cause you so much stress, there are surefire ways to win over them. Use the right amount of fertilizer. Weeds are more aggressive than grass. Too much fertilizer will nurture the growth of certain weeds. Too little fertilizer will make grass loose over weeds. Follow the instructions on the fertilizer boxes to ensure that your lawn gets more fertilizer than weeds. Water your lawn less but deeply. Sprinkle grass with about one inch of water each week. Watering too little but frequently will allow weeds to germinate more. Mow your lawn at a height that is best for your grass type – between two and four inches is the most ideal. Mowing too low allows light to penetrate the surface of the soil easily. This condition is best for weeds to grow. Hand-weed your lawn all the way down to the roots. It may be tedious but it works best when soil is moist. Use a weed killer (Herbicide). Depending on the state of the weeds in your lawn, you can choose between Pre-emergence Herbicides (weed seeds have not yet sprouted) and Post-emergence Herbicides (weeds are actively germinating). Taking good care of your lawn can be an exhausting task. However, it is important that you do it to eliminate unwanted growth that could otherwise ruin your lawn’s aesthetic beauty. Not to mention the fact that the uncontrolled growth of weeds can ruin soil quality. A weed killer is a chemical or non-chemical based product that works to kill weeds or control its growth. Choosing the right weed killer to work with is the hardest part when you are embarking on a weed-killing project. Choosing the first weed killer, you set your eyes on will not make the job any easier. There are certain things you need to know before you are finally able to choose the best weed killer. Weed killer products are extremely useful because they are made to suit different situations. There are weed killers that can attack all types of weeds and there are some that are only for a particular kind of weed. To avoid disappointments, it is important to identify the type of weed growing in your lawn first and then choose the best brand of weed killer to deal with them. Read the labels carefully. Some attack only grassy weeds while some only work effectively with broadleaf weeds. Does your lawn have small areas with weeds or have the weeds taken over almost your entire lawn? Small areas with weeds may only require a non-selective spray weed killer (suitable for all types of weeds). Make sure though that while spraying you protect the good grass. If your lawn has been totally won over by weeds, the strongest weed killer is your best remedy. Be aware though since those strong weed killers will cause the areas to be bare once you remove the dead weeds. It is important that you are familiar with the active ingredients in weed killers. This knowledge will help you know the effectiveness of each chemical as well as the level of toxicity. It will also help you be aware of what to expect when using weed killers with such ingredients. Here are a few of the common chemicals found in weed killers: 2, 4-D. This comes in acid, ester or salt chemical forms. The toxicity level of this chemical depends on what form it comes in. This chemical is often used in big lawns. Clopyralid. It’s a common chemical for killing broadleaf weeds, as well as turf plants. Corn Gluten Meal. This chemical is used for pre-emergent weeds and is only for light applications. Dichlobenil. A toxic chemical used during post-emergence in small lawns. Study each weed killer brand. Not all weed killer brands are made the same. If there are effective brands, there are also those that are not. Reading the labels are sometimes not enough. A little research would go a long way. Read some testimonials and product reviews. Learn more about organic weed killers. Kill the weeds while being mindful of the environment. Organic weed killers may be slightly more expensive than those that are chemical based, however they are the safest to use. Heard of 2, 4-D Weed Killer? And How It Works? Well, this chemical is actually one of the most common chemicals found in weed killers. This works by stopping the growth of weeds which would eventually lead to their death, that simple. But you do not need to worry about its toxicity level because the toxicity depends on what form it comes, like in an acid, ester or salt form. That is why this chemical is often used in big lawns. However, 2, 4-D is not the only chemical that will kill weeds. You will also be able to find other useful chemicals such as Clopyralid which is common for killing broadleaf weeds, as well as turf plants; Corn Gluten Meal that is used for pre-emergent weeds and is only for light applications; and Dichlobenil which is used during post-emergence in small lawns. There is no best time to kill weeds. Any time of the year is the best time. Weed killers work best though when weeds are actively growing in your lawn. This is the time when weed killers work the fastest. The day should be calm and not windy when you are working with weed killer sprays. This will avoid or minimize the solution from hitting good grass. Most weed killers need to be diluted after which they can be loaded into hand sprays, pressure sprayers or a watering can. Then, always read the label, to ensure that you are using the right tools (sprayer or watering can). There are numerous organic substitutes for chemical-based weed killers. Organic weed killer sprays though can cost more than chemical weed killer sprays. But if you have kids and or pets at home or you’re very conscious of doing your share in protecting the Earth’s ozone layer, then you won’t mind shelling out a few extra dollars for an organic weed killer spray. Most organic weed killers are non-selective and are for broadleaf and grass weeds. The beauty of organic weed killers is that they only attack the object that it is directly sprayed on. If you are going organic with your lawn weeds, you have two options. First, you can choose between citrus oil, herbicidal soaps (more refined than dish soaps) or vinegar-based organic weed killers. Organic weed killers attack the protective layers of the weeds causing them to dehydrate and eventually die. Second is, you can hand-weed your lawn! Pull them out with your hands or with a weeding tool. When using weed killers, experts would recommend that you should use it moderately. When you kill weeds the right way using the right weed killer, you will be able to spray the weeds away effectively! Most weed killers come in sprays. There is a right weed killer for every weed killing method. Contact Weed Killers. 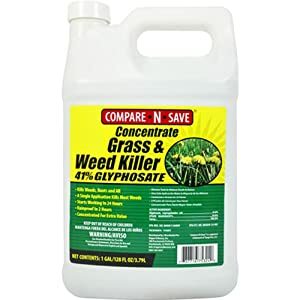 This weed killer only attacks weeds that you sprayed directly. It is available in both selective and non-selective formulations. The reaction is fast with this type of weed killer. After continuous applications, this type of weed killer weakens the roots of weeds. This is the most commonly used type of weed killer. Systemic Weed Killers. This type can be used on specific types of weeds without affecting nearby grass and plants. This weed killer requires a gestation period of about two weeks before weeds are completely killed. As mentioned above, dealing with weeds in your lawn is a tedious task. Weeds just always seem to pop up even in well-maintained lawns. Luckily there are weed killers that can help you deal with these nuances. The products listed below have received rave reviews from those who have used them. A weed-free lawn is no longer just a wish with these products. The Compare-N-Save Concentrate Grass and Weed Killer is a water soluble weed killer. For best results, it is thus recommended to be used on a dry day. It becomes safe from rainwater 2 hours after it has been sprayed. 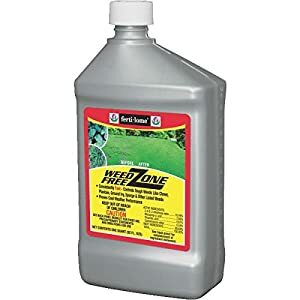 If you are going to work out weeds in an extremely large area, the Roundup Weed and Grass Killer Concentrate Plus is your best economical and effective bet. This herbicide kills weeds down to its roots. 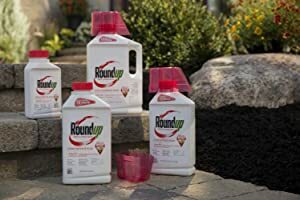 To prepare this weed killer, mix 6 fluid ounces of the Roundup concentrate with 1 gallon of water and load it into a Roundup sprayer. The Roundup Weed and Grass Killer Concentrate Plus it comes with the Fast Act Technology making results visible within 12 hours of application. This herbicide becomes rainproof after 30 minutes. When used as per label directions, the Bayer Advanced All-In-One Lawn Weed and Crabgrass Killer Concentrate will win over tough weeds and even Crabgrass. It does a good job of killing lawn weeds without causing any harm to your good grass. This herbicide works with guaranteed results with over 200 of the toughest broadleaf weeds. It is rainproof after 1 hour. For best results, water your lawn at least 1 day before applying this chemical and only if the lawn is dry. After 2 days of applying this Bayer product, you can already mow your lawn. 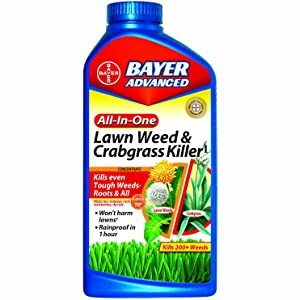 The Bayer Advanced All-In-One Lawn Weed and Crabgrass Killer Concentrate is not recommended to be used on bahiagrass, centipedegrass, Saint Augustine grass, carpet grass and dichondra. 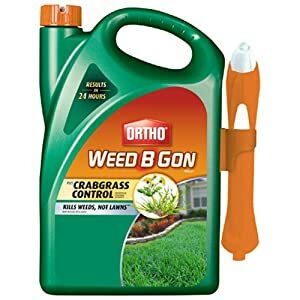 If you are sick and tired of dealing with unwanted weeds in your lawn, grab a container of the Ortho Weed B Gon Chickweed, Clover and Oxalis Killer for Lawn Concentrate! This 16-ounce formula will take care of tough weeds growing in your lawn such as Ground Ivy, Wild Violet and Speedwell and of course Chickweed, Oxalis and Clover. This herbicide kills weeds all the way to the roots and is rainproof in 6 hours. With the Ortho Weed B Gon Chickweed, Clover and Oxalis Killer for Lawn Concentrate only the weeds get killed. Good grass and the entire lawn remain protected. This product is best used with the Ortho® Dial ‘N Spray® Hose-End Sprayer or it may be attached to your garden hose. 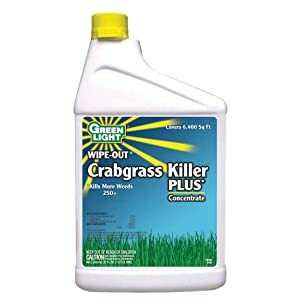 The Greenlight Wipe-Out Crabgrass Killer PLUS Concentrate includes the 2,4-d as one of its active ingredients. This chemical is safe to use because it has a low toxicity level. This product works great for big lawns and is one of the best herbicide that kills the toughest broaflreaf weeds and over 250 other weeds. Chickweeds, Clovers, Dandelions and Foxtails are a piece of cake with this Greenlight concentrate. This product only kills the weeds and keeps the good grass in your lawn unaffected. The Spectracide Weed Stop For Lawns Plus Crabgrass Killer Concentrate comes in a formulation that can kill weeds in as little as 8 hours upon application. It has the power to deal with over 250 kinds of weeds including the broadleaf varieties such as dandelions, clover, and chickweed. On the label is a complete list of weeds it can handle down to the roots. For best results, work this Spectracide weed killer only in the daytime when the temperature is between 45-900F. The Spectracide Weed Stop For Lawns Plus Crabgrass Killer Concentrate can cover up to 5,000 square feet of lawn area for every 32-ounce concentrate. This weed killer counts the low toxicity 2,4-d as one of its active ingredients. Within 24 hours upon application, you will be able to get rid of unsightly weeds with the Ortho Weed B Gon MAX Weed Killer for Lawns Plus Crabgrass Control Ready-To-Use Trigger Spray. This product is by far the toughest weed killer produced by the Ortho brand. It comes with its application trigger for easy use. This herbicide can deal with over 190 kinds of weeds all the way to the roots. The Ortho Weed B Gon Weed Killer for Lawns Concentrate is rainproof in 1 hour. When used as per label instructions, visible results will appear after only a few hours after application. The Fertilome Weed killer counts Carfentrazone, 2,4-D, mecoprop-p and dicamba as its active ingredients. 2,4-D is a weed killer that is low in toxicity. Mecoprop-p is a multi-purpose herbicide commonly found in most weed killers as well as “weed and feed” fertilizers. It mainly deals with broadleaf weeds. Dicamba is a wide-based herbicide that deals mostly with annual weeds. Carfentrazone is a herbicide that when sprayed directly into sedge and broadleaf weeds can kill them. The Ferilome comes in a concentrated formula. On the label of the Fertilome is a complete list of all 80 broadleaf weeds this weed killer can control and kill. This weed killer has a fast reaction time with visible results after only a few hours after application. 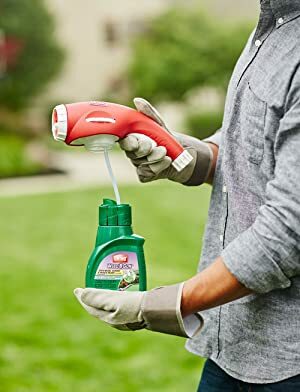 The Roundup Weed and Grass Killer III Ready-to-Use Comfort Wand Sprayer is ready to use from the box with no mixing required. Its special battery operated wand makes this weed killer easy to use. This weed killer effectively deals with weeds in both cloudy and cool kinds of weather. It also works perfectly even on sunny and warm days. 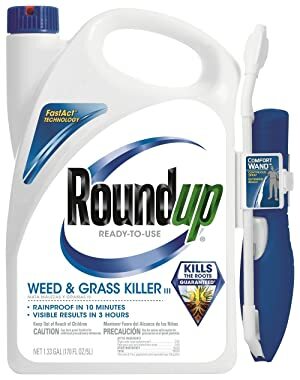 The killing power of this Roundup product will only target weeds’ leaves and stems and will not affect good grass and the soil. This low-cost weed killer is rainproof in 10 minutes, and visible results are produced after only 3 hours. Just like most weed killers, this Roundup product gets the job completely done in 1 week. To allow this Roundup weed killer to get all the way down to the roots of weeds, it is b you water your lawn after spraying. There are a lot of weed killers available in the market to target different kinds of weeds. As has been mentioned above, it is always best that you learn as much as you can about lawn weeds and how to effectively deal with them. Before using weed killers always make it a habit to read the labels. This will ensure that you use the product properly to get the best results. It will be such a futile exercise, a total waste of time and money if you are not using the product the right way. Most important of all, use the right weed killer for the type of weeds you are dealing with.